Please help me welcome author Christi Caldwell who is here today with an excerpt of her newest historical romance, Always A Rogue, Forever Her Love book four in her Scandalous Seasons series which just released yesterday! Miss Juliet Marshville is spitting mad. With one guardian missing, and the other singularly uninterested in her fate, she is at the mercy of her wastrel brother who loses her beloved childhood home to a man known as Sin. Determined to reclaim control of Rosecliff Cottage and her own fate, Juliet arranges a meeting with the notorious rogue and demands the return of her property. Jonathan Tidemore, 5th Earl of Sinclair, known to the ton as Sin, is exceptionally lucky in life and at the gaming tables. He has just one problem. Well…four, really. His incorrigible sisters have driven off yet another governess. This time, however, his mother demands he find an appropriate replacement. When Miss Juliet Marshville boldly demands the return of her precious cottage, he takes advantage of his sudden good fortune and puts an offer to her; turn his sisters into proper English ladies, and he’ll return Rosecliff Cottage to Juliet's possession. Jonathan comes to appreciate Juliet’s spirit, courage, and clever wit, and decides to claim the fiery beauty as his mistress. Juliet, however, will be mistress for no man. Nor could she ever love a man who callously stole her home in a game of cards. As Jonathan begins to see Juliet as more than a spirited beauty to warm his bed, he realizes she could be a lady he could love the rest of his life, if only he can convince the proud Juliet that he's worthy of her hand and heart. Jonathan sucked in his breath as the spirited vixen who’d dealt rather handily with Lord Whitby a short while ago revealed herself. Here, in the closeness of his carriage, he could appreciate that which he’d not noted a short while ago. Her green gaze, the color of the richest emeralds, the fiery crimson curls piled high atop her head, and a smattering of freckles along her high cheek-bones. “You, sir, have something I want,” she breathed. Which was rather good for him, because he rather wanted her as well. A recalcitrant red curl tumbled free from the precarious arrangement of her locks. He followed the path of that captivating strand as it bounced and then fell, nestled in the slight gap in her cloak, between her breasts. Jonathan fixed his gaze on that crimson curl, never more jealous of a slip of hair than in that moment. He reached out and caught the siren’s lock. He raised it to his eyes, wishing it were day so the sun could bathe her in its light and illuminate the vibrancy of the fiery shade of red. The shocked disgust underscoring those few words jerked Jonathan from the haze of desire that had engulfed him. He angled his head. “Would you like me to?” Because he rather hoped her answer was in fact; ‘yes, that and more, my lord’. The green of her eyes darkened nearly black jade. “You are mad, my lord,” she hissed. His head snapped back, the resounding crack from her solidly dealt blow rang in his ears like the church bells on Sunday. He rubbed his cheek and flexed his jaw. Goodness, she was a bloodthirsty wench. Perhaps it had been Whitby who’d needed saving after all. Jonathan folded his arms across his chest, intrigued as to what the fiery-eyed beauty should want, if not a place in his bed. He waved a hand. “Well, then, Miss…?” Her lips set at a mutinous line. Ah, so she didn’t intend to tell him her name. Very well, in time then. “Miss, just miss, then. You wished to speak with me about something you want?” Something which unfortunately is not my kiss and hands upon your person. She trailed the tip of her tongue over the seam of her lips. He noted the telltale sign of her nervousness, and a desire to know what brought a gently reared lady outside the Hell and Sin Club filled him. His intrigue doubled. “Rosecliff Cottage,” her soft whisper cut into his wondering. He angled his head, still studying the bow-shaped red lips that begged to be kissed. With their bodies’ nearness, he detected her swift inhale. Her throat bobbed up and down. She glanced over to the opening, and then back to him. “I cannot go out there,” she bit out. He hesitated a moment, then pulled the door closed, eyeing her with even greater interest. Yes, her tones cultured and clipped were those that belonged to a refined lady, and yet…refined ladies did not wander these particular streets and demand to speak to gentlemen about matters of business. Jonathan pulled out his watchfob and consulted the time. Nor did refined young ladies go out, unchaperoned at two o’clock in the morning. She seemed to follow his unspoken recriminations for she inched forward in her seat. “Rosecliff Cottage,” she repeated. Christi Caldwell is the bestselling author of historical romance novels set in the Regency era. Christi blames Judith McNaught's "Whitney, My Love," for luring her into the world of historical romance. While sitting in her graduate school apartment at the University of Connecticut, Christi decided to set aside her notes and try her hand at writing romance. She believes the most perfect heroes and heroines have imperfections and rather enjoys tormenting them before crafting a well-deserved happily ever after! When Christi isn’t writing the stories of flawed heroes and heroines, she can be found in her Southern Connecticut home chasing around her feisty five-year-old son, and caring for twin princesses-in-training. 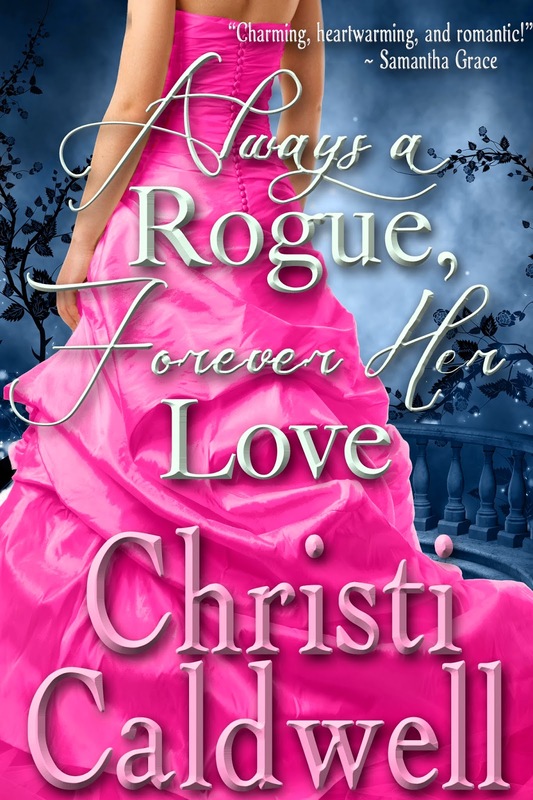 Giveaway: One Ebook copy of Always A Rogue, Forever Her Love to one person who comments on Christi's blog here.